Actually that’s one of the early surprises of Capote’s novel. When Mr Yunioshi is first described, the narrator corrects barman Joe Bell that he is not Japanese, he is Californian. The character of Holly Golighty has already been enshrined as a mythical figure by the start of the novel, appearing in far-off Africa and word travelling all the way back to New York. Her past is shrouded in mystery, her personality entirely self-created – peppering her dialogue with random words in French and her manner occasionally quite abrasive. The narrator makes the fatal mistake of attempting to read his writing to her, only for her eyes to quickly glaze over (with the legendary dismissal afterwards that she has no interest in reading about lesbians). Despite his wounded vanity, he cannot help becoming fascinating with the mysterious Holly. You may notice that I have not really described anything like a plot. Well there are a number of instances, building up to what could be called a climax, but in reality this is a profile of an irrespressible free spirit. In fact her role is quite Wildean in that she is fond of making the occaisonal bon mots, but has no interest in profundity, or tortured meaning. She mocks the narrator for his frustrated writer status. If he is not writing to make money, what is the point? His earnest social realist stories will not bring Hollywood calling. Truman Capote appears to have inserted his own auto-critique on the futility of art in his most popular fictional creation. However, it is easy to understand exactly why such a ephemeral novella has maintained its hold over the years. 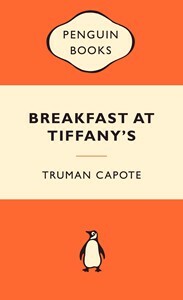 For one there is a fascination with the various gay shibboleths that Capote has slipped in under the radar (along with some not so secret references). So much of the humour and wit that still sparkles in this book is due to the acerbic employed in Golightly’s disparaging remarks regarding other characters. Poor Mag Wildwood is said to have contracted the clap so often she has had an applause. It’s the way you tell ’em. I cannot hope to watch the delivery of the line. Sharply funny, with a fierce intelligence belied by the superficial film adaptation.